This was an eleven day cruise around the British Isles. Norwegian Jade called at Guernsey in the Channel Islands; Portland in Dorset; Cobh, Ireland; Dublin, Ireland; Belfast, Northern Ireland; Kirkwall in the Orkney islands; Invergordon, Scotland; and Edinburgh, Scotland. A British Isles cruise is significantly different than a cruise in the Caribbean. The emphasis is very much on the ports of call. Even on a sunny day, the pool deck and outdoor facilities are nearly empty. Almost everyone goes ashore each day for most of the day to explore the culture and history of the ports of call. On this cruise, there were only two sea days. Thus, the ports were of prime importance and they proved to be a good selection. Although the ports were all in the British Isles, the guests experienced the cultures of several countries - - England, Scotland, Ireland and the unique mixture of British and French cultures found in the Channel Islands. There were the urban centers of Dublin, Belfast and Edinburgh as well as the less developed ports of Guernsey, Kirkwall and Portland. Ports such as Kirkwall and Portland featured splendid natural scenery while Dublin, Cobh, Belfast and Edinburgh offered history. Very good variety. Two of the ports were tender ports - - Guernsey and Edinburgh. In Guernsey, local tenders supplemented the ship's tenders but in Edinburgh, there were no local tenders available and the ship had to rely on its own boats. This combined with the distance the boats had to travel resulted in some delay and passenger discontent. Many passengers were also puzzled as to why they had to tender at all in a large urban center like Edinburgh. The reason is that most cruise ships cannot pass under the Forth Rail Bridge built in Victorian times. Smaller ships can pass under and often dock at Rosyth but even a medium size cruise ship such as Norwegian Jade cannot make it under the bridge. As a result, they have to anchor in the Firth of Forth and tender passengers ashore. The weather on this cruise was quite good. The temperature was cool but for the most part dry. The locals pointed out that that was unusual. Along the same lines, the weather posed no challenges for Norwegian Jade. A Jewel class cruise ship built by Germany's Meyer Werft, the Jade is a good quality cruise ship with good speed and maneuverability. Jade had recently undergone a major refit. She was built originally as Pride of Hawaii for Norwegian's ill-starred NCL America operation. 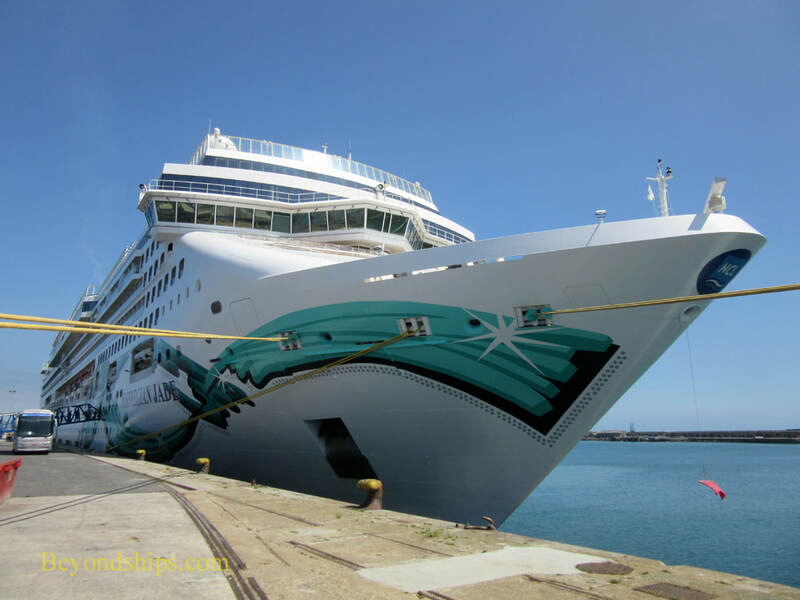 When that operation failed to achieve the goals Norwegian had hoped for, she was brought into the regular Norwegian Cruise Line fleet as Norwegian Jade. However, much of her original Hawaiian decoration remained. During this refit, Jade was given a new look. 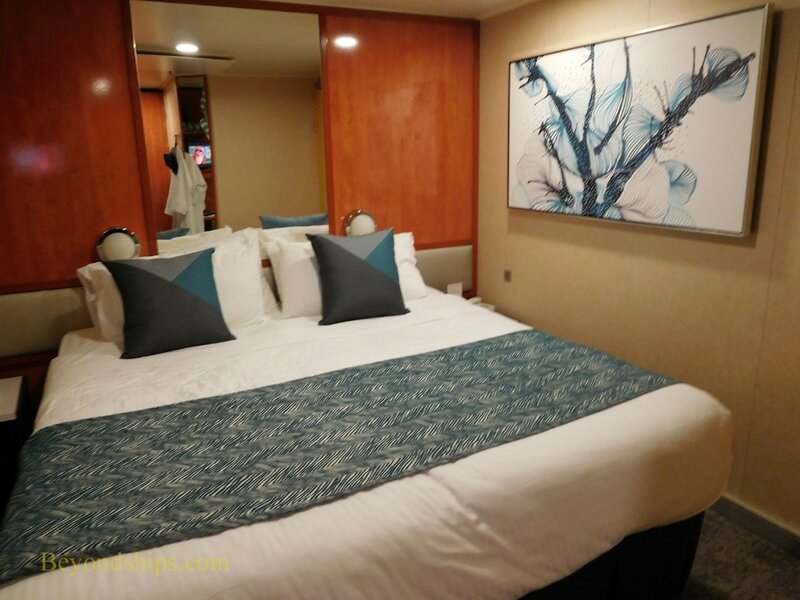 Most of the Hawaiian decoration was removed and the ship has a new contemporary look. As on sister ship Norwegian Gem, the designers gave the ship a more up-market look with more subtle colors. This new look extends not only through the public areas but also into the cabins, which have been refurbished. Altogether a very successful re-fit. As part of the refit, the Moderno specialty restaurant was moved from Deck 8 to Deck 13 and O'Sheehan's Bar and Grill occupies the entire mezzanine overlooking the lobby. This change brings the Jade into line with the Gem and gives both restaurants more space. Jade has a good variety of specialty restaurants and alternative dining venues. You can have a very good meal in the main dining rooms but you are only sampling part of the experience on a Freestyle ship if you stick just to the main dining rooms. We were particularly pleased with La Cucina, the Italian specialty restaurant, which was given a new look during the recent re-fit. Up until a few years ago, the highlight of an evening in La Cucina was the pizza, which was baked to order. Strangely, just after several of the ships were equipped with new pizza ovens, someone made the decision to eliminate pizza from the La Cucina menu. We were very pleased to find it on the menu on Jade. Fresh and nicely cooked, it can serve as an appetizer or as a main course. We returned to La Cucina several times because of it. We also liked Le Bistro, the French specialty restaurant. The beef fillet at Le Bistro is usually quite good and it was so here. However, what made the evening memorable was the good service that we received. The service on Jade was generally good. In North America, most guests expect the crew to be very friendly and pro-active. In Britain and in Europe, most guests expect the crew to be more reserved and unobtrusive. Thus, on a ship with both North Americans and Europeans, the crew has to balance their performance between these two conflicting models. Most or the passengers on this cruise were from North America. Since it took place while schools were still in session, there were very few young families with children. Above: An inside cabin with the original decor. ​Below: An inside cabin after the 2017 refresh.